TV show dates: June 18, 2018 — present. Performers include: Jesse Palmer (host); Ellen K (announcer). From Mike Fleiss, creator of The Bachelor franchise, The Proposal TV show is a new dating reality TV series. 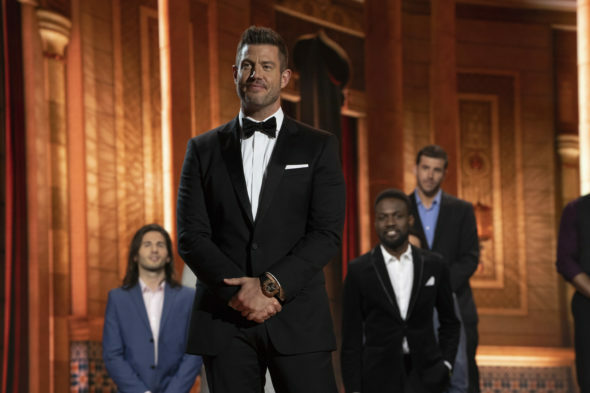 Former NFL quarterback Jesse Palmer hosts the hour, during which matchmakers will select a panel of eligible men or women, to compete for the heart of a mystery suitor. The episodes play out across four pageant-style rounds: first impressions; beachwear; questions and answers; and family member vetting. Participants are eliminated after each round. Once there are only two contestants remaining, the mystery suitor is revealed, in order to make a romantic proposal. What do you think? Do you like The Proposal TV series? Should this ABC reality TV show be cancelled or renewed for another season? Please keep it going I love it.